Shrink Wrapping Machines to package your product 24/7, backed by global support. Autopack design and manufacture a range of Quality Bundle Shrink Wrappers for most products and most industries. Modular design with speeds ranging from 10 to 130 packs/min and scalable technology to suit needs and budgets of Small businesses up to Multinational Corporation. 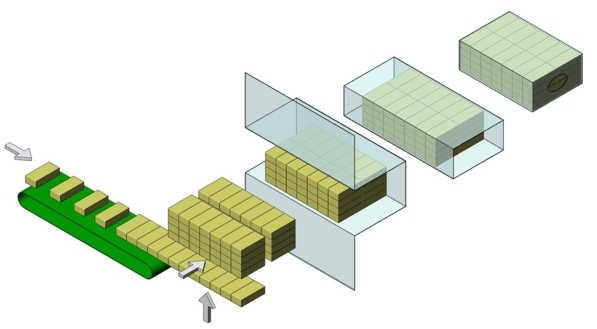 The animation illustrates the principle of shrink packaging using basic product collating options. Choosing the right machine requires deeper knowledge of product, packaging process and machine options. Contact Autopack People to help you make the right choice. One of the world fastest overlap machine using conventional motors (no-servo drives used) ! Tray Packing Machine, with automatic Tray Erecting, Glueing /Product Collation and Loading, followed by Tray Shrink Wrapper. 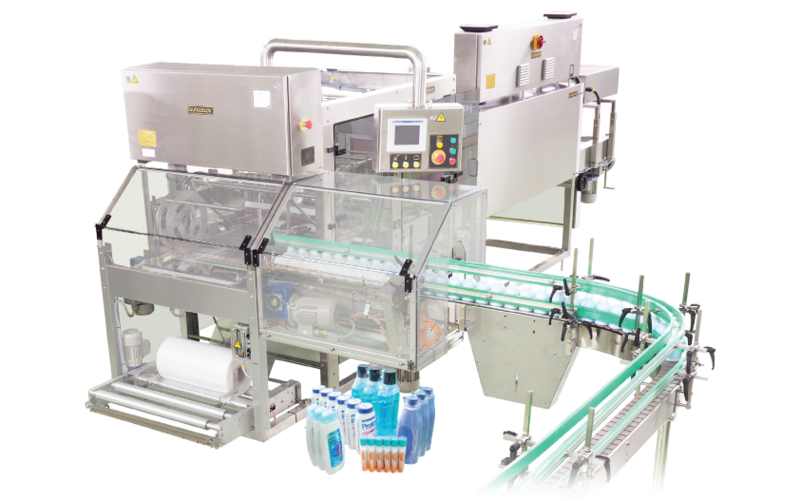 This is a fully automatic Tray Packing machine designed for in-line operation with other Autopack packaging machines thus forming a complete EOL (End Of Line) packaging solution. The machine will from tray from flat cardboard blank, collate product and load it onto the tray, finally glue and discharge the pack onto the infeed of tray shrink wrapper. Medium speed Bundle Shrink Wrapper for bottles, cans, cartons in cosmetic, pharmaceutical, beverage, grocery, chemical and many other industries. With in-built versatile collator, only one change part, the machine can be adjusted in 5 min for different pack and product size. The SLU option permits Shrink Wrapping pre-filled trays or boxes. Stainless Steel GMP construction and compact size. Higher speed Shrink Bundling of beverage, grocery and other products. 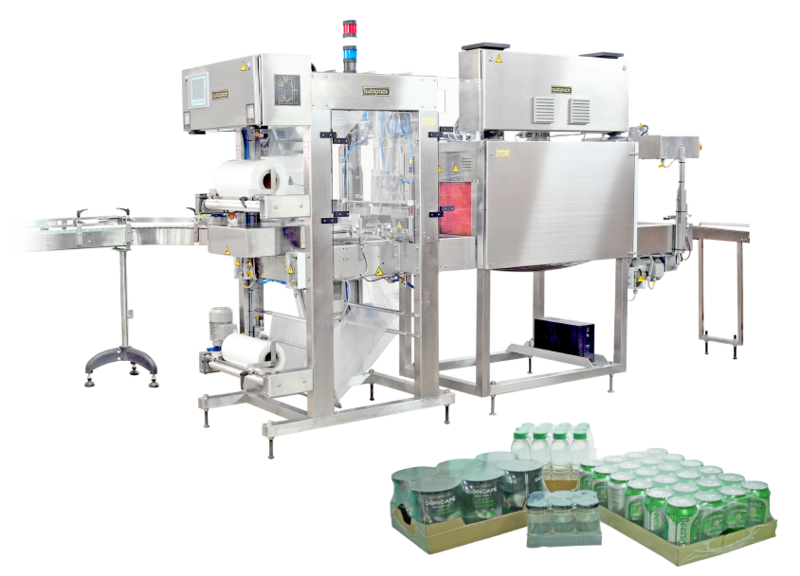 Available with optional diverter for oblong, rectangular or square bottles, filling up to five lanes can achieve line speeds up to 300 bottles per min. Shrink wrapper with integral vertical collator for stacking cartons, soap cakes and other rectangular objects. Features, Stainless Steel GMP construction compact inline layout, ideal for Pharma, cosmetic and other industries. Autopack SLV is designed for stacking and shrink wrapping of flat rectangular objects, such as cartons, soap cakes, toothpaste, reams of paper, shoe boxes and many others. All stainless steel GMP finish makes it an ideal Shrink Wrapper for pharmaceutical and cosmetic industry. The SLO Shrink wrapper is designed for efficient handling of oval shaped products. Ideal machine for packing oval bottles in cosmetic and home care product. It can also shrink wrap round bottles cans and jars. Fully Automatic Shrink Wrapper for product on tray. Cardboard pad gives extra strength to shrink wrapped products for better handling and stability on pallet. Designed for Shrink Wrapping of pre-loaded trays or single box like items needing protection. Typically used downstream of Automatic Tray packer or Manual tray loading station. 62SLA is a MultiShrink Bundle Wrapper for UHT packages. The machine is adjustable from 3x1 to 4x3 and can wrap up to 15,000 pph. Designed for use in TBA19, TBA22 and A3 speed lines in 1 to 3 machine solutions. 62SLA-05 features Plug & Play integration with Tetrapak® lines with matching conveyor and communication interfaces. 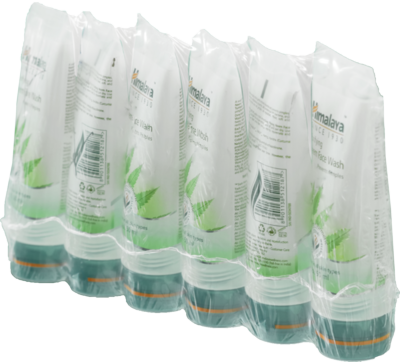 Universal design for packing Aseptic cartons such as TetraBrik® Combibloc® Easily adjustable for different formats. Small footprint economical. Used Shrink Packaging of Dairy, Food, Beverage and other products. Higher Speed Bundle Shrink Wrapper for packing Oval Bottles which need rotation before wrapping. The machine can also handle other containers such as cans, cartons. Due to high speed and small size the CMOS SLO is popular in Pharmaceutical and cosmetic industry. 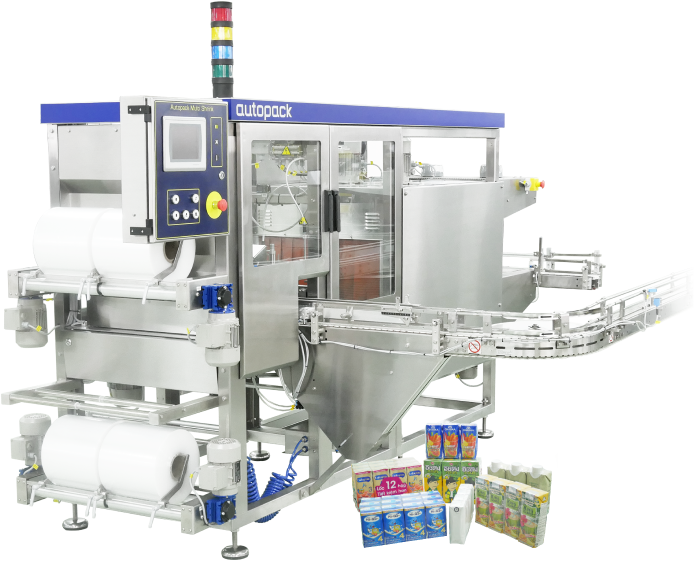 Autopack SLT - Machine for Multipacking cream tubes without trays. Machine for Shrink Packing of Tubes (Cream/Toothpaste/Hair care) Featuring Indexing infeed designed for manual or robotic loading. Adjustable for different collations. Ideal for complex shaped or collation such as top-to-tail water or juice in cups. Personal care products in tubes, due to their shape, are traditionally placed inside small cartons before the next packing stage for retail or transport. 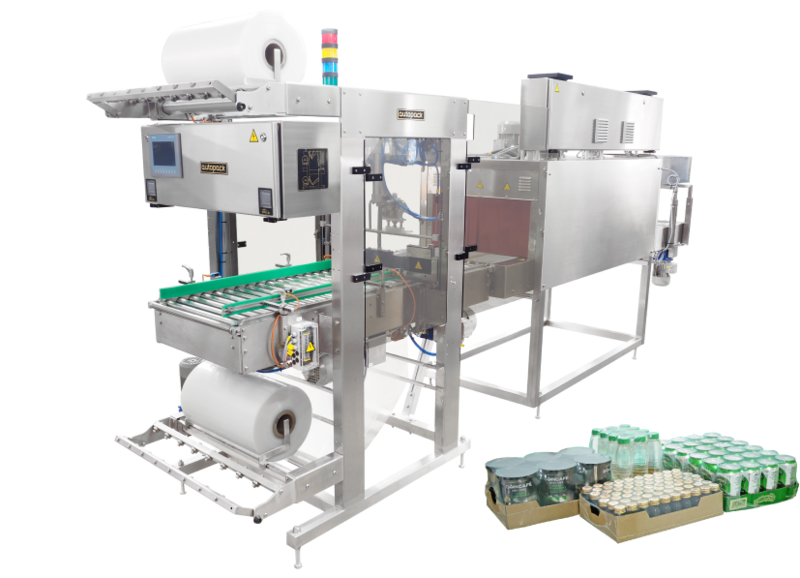 Once enclosed, the rectangular shape of the carton allows for easy multipacking with standard shrink packaging machines having integral vertical or horizontal collators. However, in recent years there has been a demand for packs containing as little as two tubes. In such cases, the cost of both using a carton and wrapping in shrink film is significant, which has led to increasing demand for the packaging of tubes without carton. The tubular shape flattened at one end, sometimes with smaller cap than the body, presents some challenges in conveying, grouping and wrapping. Packaging machine manufacturers that took up the challenge produced two kinds of machines, ones with tubes laying flat during conveying and packing process, ones with tubes standing up. Standing tubes require the cap to be flat and nearly the same diameter as the body to avoid toppling during the packaging process. In response to recent customer requests, Autopack has developed its SLT Shrink Packaging System for tubes, capable of wrapping up to 50 multipacks / min. The SLT uses an indexing conveyor with adjustable restraints separating each group. In most cases the tubes arrive from a tube filler laying flat; if so the indexing conveyor has to be manually or robotically loaded. Autopack welding bar type Shrink Wrappers can wrap up to 30 bundles per min, however the final packing speed depends on how quickly one can prepare the bundle before the wrapping process. When packing cartons such as tooth paste, pharma tablets, soaps cakes etc, the collation is generally prepared by a vertical collator. In a typical vertical collator cartons accumulate on top of a lifting plate which elevates the cartons to higher level, where they are retained by suitable latches. The process is repeated until preset packing quantity is made after which the group is transferred into the sleeve shrink wrapper. The speed of preparing the bundles is dependent on the maximum number of lifts the collator can make and the stacking format. A typical pneumatic collator can make approx 40 lifts / min. So if we are packing 10 cartons in a 5x2 format (5 across and 2 high) we can make approximately 20 complete packs per min ( 200 cartons per min). However some cartons, due to their geometry, need to be packed 2x5. In this case the stacker has to lift 5 times to make one complete bundle which drops the speed to 8 packs per min. To speed up the collating process Autopack have introduced a unique "Staircase" collator which can stack narrow and tall packs, much faster than traditional bottom up stacker. Recently installed Autopack Machine for Shrink Packing of tapered Ice cream tubs.Totally Cool Icecream in USA is able to shrink wrap Ice cream tubs without any cardboard support. By inverting the tubs one up one down the Tubs form a stable group resulting in a solid pack after shrink wrapping. Autopack's Michel Nigrowsky joins Andrzej Sliwinski of Autopack PL and Andrzej Golembiowski at Taropak International packaging exhibition in Poland, one of the largest exhibitions in the region with visitors from surrounding countries. 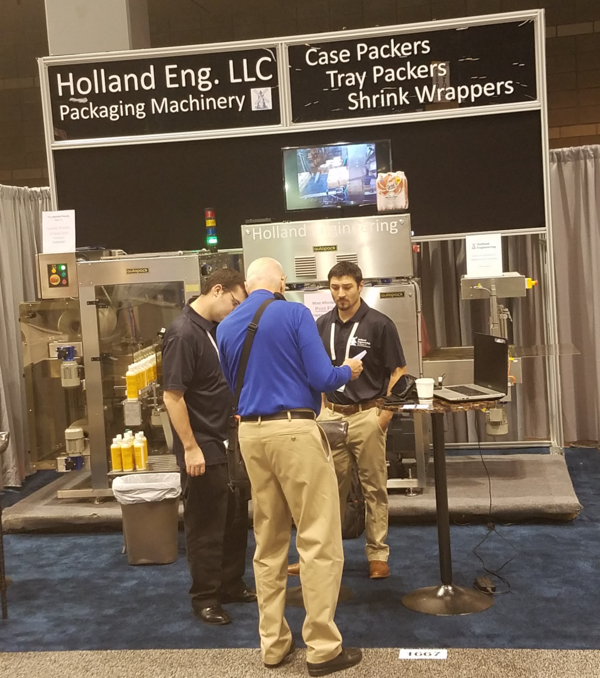 Autopack PL displayed 50SIM Overlap Seal Shrink Bundle wrapper configured for packing bottles. 50SIM continuous motion machine is an ideal solution for producing small multipacks in dairy, cosmetic and pharmaceutical industry thanks to small foot print and relatively high speed. Like most physical exhibitions, Taropak besides finding new clients, it is an opportunity to catch up with existing customers, discuss new projects, get feedback on installed machines, discuss improvement and new solutions. 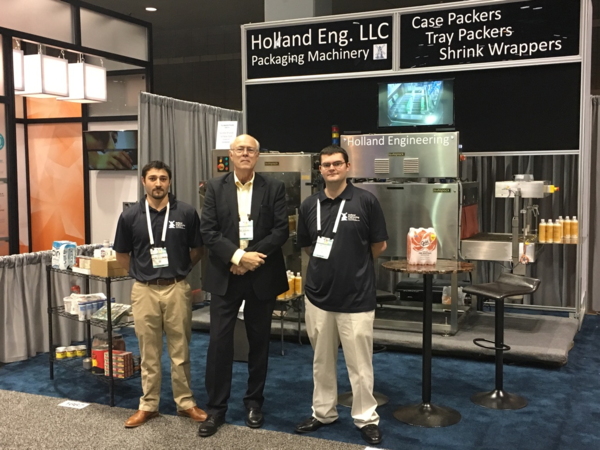 Peter DeHertog says: We had a very productive show in Chicago and as result looking forward to a very productive end of 2018 and an even better year in 2019. 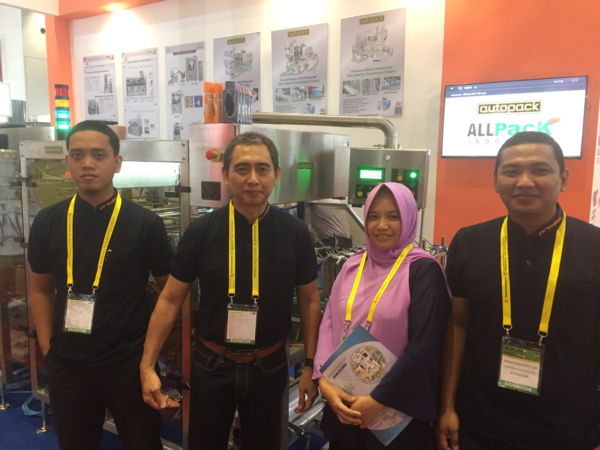 Allpack Indonesia provided another opportunity for Autopack to display its product. 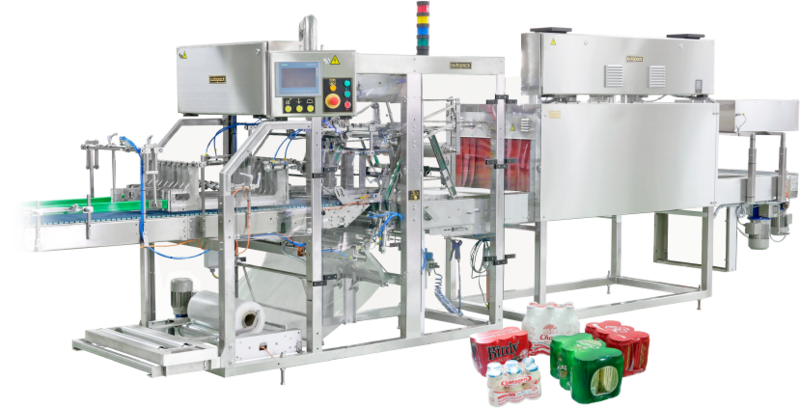 This year Autopack displayed its top of the range, high speed Bundle shrink wrapper for packing bottles, cans in food & beverage, pharma, cosmetic and household chemistry. 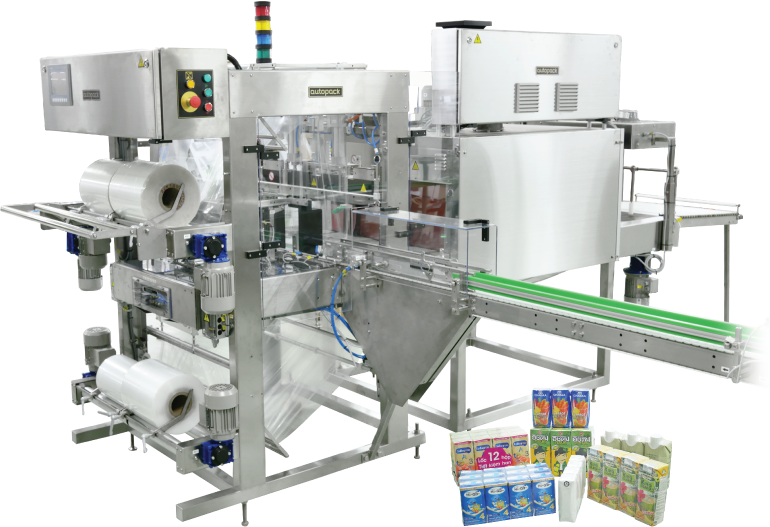 50 SIM is a low cost Bottle packing machine for producing attractive packs with overlap seal at the bottom and printed film for added attraction. Warsaw Pack held for the forth time, is proving to be a successful Packaging Exhibition in Poland. Most polish exhibitions are traditionally held in Poznan, western part of Poland while, Warsaw, being more centrally located is attracting not only Poles but also international visitors from surrounding countries as well as visitors from African continent, taking advantage of direct flights. Autopack PL Andrzej Śliwinski is calling it a success, meeting new customers and finalizing deals on existing enquiries. We excited to invite everyone to out stand I167 at Auspack 2019. This year the biggest Australian packaging machinery exhibition will be in Melbourne Convention and Exhibition Centre on the 26-29 of March. Autopack will display a shrink-wrapping machine at the show. We will be happy to see you there! For the information about the Auspack 2019 please click here. Great results from AUSPACK 2019 in Melbourne. I just came back from last week's exhibition in Melbourne AUSPACK 2019. It was the leading show in the southern hemisphere for the processing and packaging industry. At our stand we presented Autopack fully automatic shrink wrapping system with multi-line infeed and pneumatic divider / line splitter. The show went absolutely fantastic and I want to extend our cordial thanks to all visitors, existing and new customers and friends.